The Engage International Conference will explore the challenges that education in galleries and the visual arts face in a period of uncertainty. Looking to the Future: The impact of change in formal education on galleries and visual arts education. Change in an International Context: Learning from practicioners' experience outside the UK. Innovation, Entrepreneurship and Sustainability: Exploring new models to support visual arts education. The Conference programme will propose a range of possible responses and ways forward, as a starting point for debate and conversation. Issues with the current curriculum, shifts in formal education, and a look at what colleagues overseas in different circumstances are doing, will all be up for discussion. The 2013 Conference takes place on Thursday the 7th and Friday the 8th of November, with Fringe events on Wednesday the 6th and Thursday the 7th of November. To attend the conference you must purchase tickets online. The conference will be based at the City of Birmingham Symphony Orchestra (CBSO) Centre in the city centre, with sessions also held at Ikon Gallery. 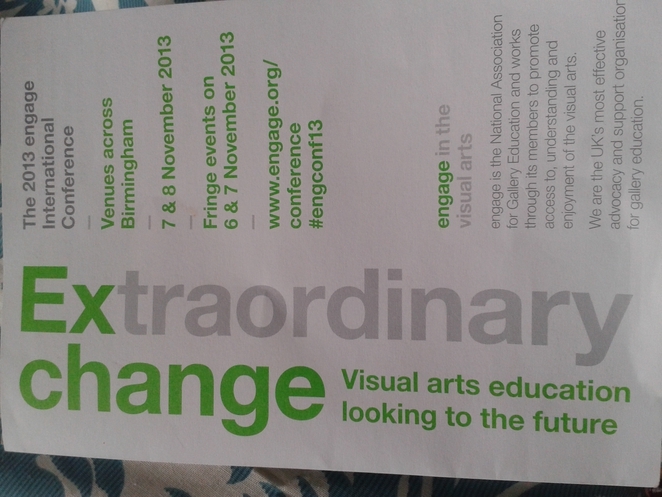 From 1pm - 5.30pm on the 6th of November, the Conference Fringe costs £10. The 6-8pm slot is free, and the session from 9.30am - 11am on the 7th November costs £5.00. The cheaper options are perfect if you're a teacher or simply have something to say about the provision of the arts in education. Booking forms can be found at Cornerhouse in Manchester, but if you'd rather do it online, see their website. Engage is the National Association for Gallery Education and works through its members to promote access to, understanding and enjoyment of the visual arts.